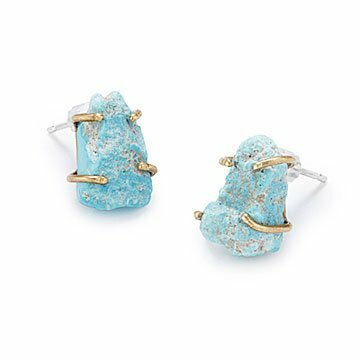 In their simple, timeless setting, Emile Shapiro's raw turquoise earrings emanate ancient powers. Turquoise's association with sky and water has always made it a natural for ceremonial jewelry. For thousands of years, and for cultures around the globe, it has symbolized power, nobility, and immortality. By giving the raw stones a timeless setting of delicate, simple, brass prongs, Emile Shapiro lets the stone's story take center stage. Those born in December can claim it as their birthstone, but with a history so universal, its special powers aren't limited just to them. Each piece will vary slightly due to the uniqueness of the stones. Handmade in New York. There was never a moment that Emilie Shapiro didn't consider herself an artist. "Before I could speak I expressed myself through what I made with my hands," she says. "I am so incredibly lucky that my parents allowed me to pursue life on the path I chose." That path led to a line of jewelry comprised entirely of one-of-a-kind pieces she crafts by combining her metalsmithing skills with her love of found objects. "I have a massive stone collection that I started when I was two," says the New York City resident. "I usually pull out my drawers of gems and minerals and something catches my eye that I haven't seen before or forgot about." When Emilie creates a piece, she says she imagines the wearer seeing a reflection of themselves in it—“beauty in imperfection." Avoid contact with harsh chemicals. Store in jewelry box to prevent tarnishing. To clean soak jewelry in warm water with mild soap and gently scrub with a soft bristled brush.